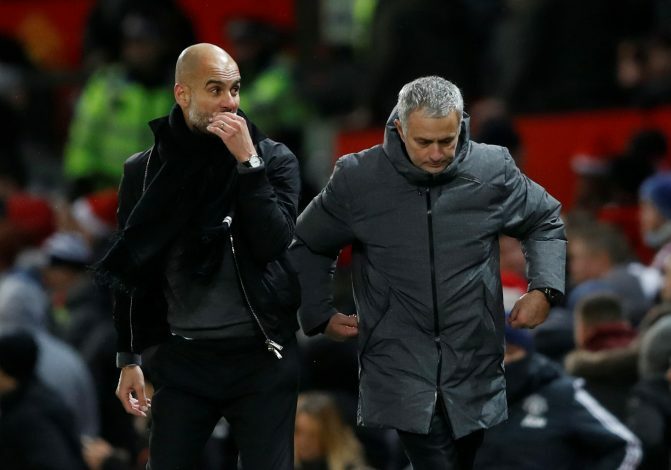 Jose Mourinho took a fresh dig at Manchester City in his latest post-match press conference, by claiming that the Citizens splurge crazy money, and buy full-backs for the price of strikers. The Portuguese spoke out after his side’s 2-2 draw at home against Burnley at Old Trafford, as United’s winless run spread across three games in all competitions. The Red Devils let in two injury-time last-minute goals in their previous two games, and on Tuesday, they failed to break a well-drilled Burnley defence, and had to settle for a solitary point. Jesse Lingard scored twice in the second half to salvage a point for Jose’s side, after strikes from Ashley Barnes and Steven Defour before the break. United are now only a point above Chelsea in 2nd place, but could find themselves go 15 points behind the league leaders if the Sky Blues beat Newcastle United, thereby all but ending the Premier League title race. Both the Manchester clubs have spent heavily since last year, since Jose and Pep Guardiola’s arrival, but United seem to have spent a few millions lesser than their neighbours. When quizzed about this investment and the fact that City are miles ahead, Jose replied rather frustratingly, by stating: “Manchester City buy full-backs for the price of the strikers, so when you speak about big football clubs, you are speaking about the history of the club. Jose was frustrated with the way his side has been performing off late. They have shipped in easy goals, and have lacked the teeth to dispose off teams. With his comments on Tuesday, it clearly looks like he is eager to spend more and challenge for the title next season, after another blip on the cards this term.